This was a good week personally but a bit sloppy financially. I started a great new gig contract, and worked towards an amazing opportunity with a magazine that hopefully will pan out soon. Fingers crossed! I had another big (planned) purchase this week and so planned to use the results of my kitchen audit to keep grocery shopping to a minimum in order to use food items we already had in the house as the basis of most of our at home meals. A little planning goes a long way for me and disruptions to my schedule, even welcome ones like starting a new client contract, can throw me off. I did a decent amount of meal prep, but wasn’t as organized overall as I should have been and so even though I cooked plenty, I didn’t pre-package as I should have. Getting out the door in the morning therefore involved a couple of extra steps, which were all too easy to discard. And now that I’m in a client office all day and coming home later, my willpower to be productive in the evening has been a bit…lacking. I ended up using over a quarter of my monthly cash allowance on food on the go–definitely one of my Achilles heels. Therefore this weekend we’re both of us doing some shopping and prep together to do better next week! 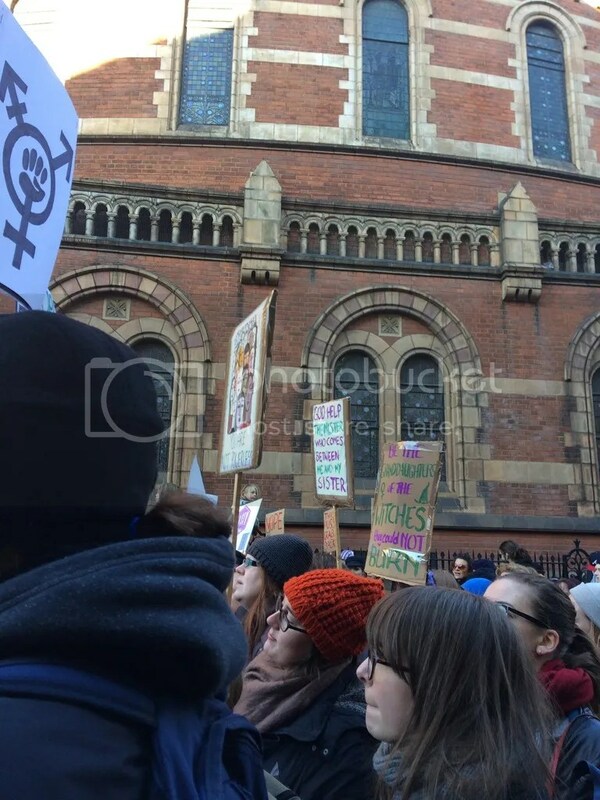 But first, I’m eating doughnuts following the Womens March in London. We were naughty and decided to grab Indian takeaway, but in order to justify it, we switched up our normal order to ensure we each got at least three meals each out of our spend, which took care of several dinners this week. Months ago I signed up for early access to Hamilton tickets, which is opening in London at the end of this year, and buying opened up today. Our show date is months and months away, so there’s no quick emotional payoff, but I managed to score non-nosebleed seats for a fairly reasonable price! Alas for an absent mind and a need for toiletries. We’d made it as long as we could using up our travel sized contact solution bottle, but had run out and so a Boots run was needed. This was the first of a stretch of days where I really failed to get my ducks in a row. I got a better start to the day but had to do another Boots run when we realized we were out of yet more things in the bathroom, like cotton buds. Yikes! £30.00 on doughnuts? Only in London! By the way, I really hope my comment doesn’t sound judgy. I didn’t mean it that way — I was just amazed by big city prices. Have you ever heard of or used the YNAB app? That’s my absolute favorite budgeting tool. The times I’ve been successful at budgeting have been when I’ve been using YNAB. So easy, and makes so much sense. I’d definitely recommend taking one of their free webinars to get started – they explain the rules that make up the theory behind the software, and then how to use the software. It’s seriously the best. Terry and I both had an alarm set in the evening to add in anything we’d spent that day into the app – it was the best way to keep track of our spending, saving, and goals! Did/do you use the online or the download version? I’m app illiterate, but I need to check that out! We found barbecue and brisket. Easter holiday so far has been bangin’.